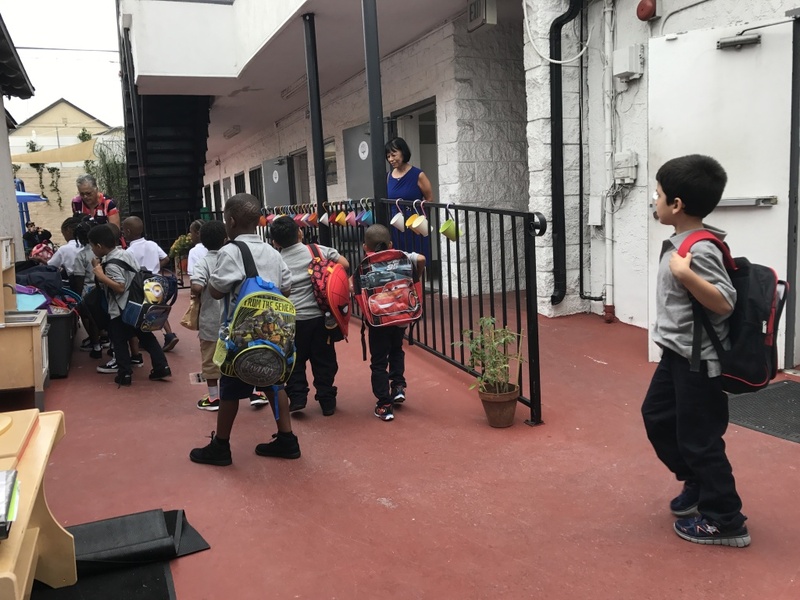 A new charter school aimed at specifically serving homeless and low-income children in South Los Angeles opened its doors Monday. The Crete Academy, on a short commercial strip of Crenshaw Blvd., welcomed 130 elementary school students on its first day, with potential space for 12 more enrollments. At the moment, Hattie Mitchell, the school's founder and CEO, estimated about 10 percent of students in the school are homeless. The majority of students are in low-income families. L.A. County has an estimated 63,000 students in public schools who are homeless. Mitchell said Crete Academy is the first to specifically target such students in South Los Angeles. "We're able to serve them by providing wraparound services and a college prep curriculum," Mitchell said. "We're unique in that we believe a child's wellbeing is as important as their academics." The school guarantees children two medical exams, two dental screenings and access to mental health services onsite. Of the school's 15 staff members, seven are dedicated to "wellness." That includes social workers and caseworkers from the AmeriCorps program. Parents also have access to the social services provided at the school. Mitchell said for homeless students, the school has partnerships with nonprofits to try to get the families into permanent housing. Building partnerships is the model in general, with the school tapping mostly into existing resources within the community to provide its students with services beyond those offered on campus. The school's first day drew a typical crowd of nervous, excited parents, snapping photos of their children as they took their places in line and made their first walk down the corridor into school. Marquesha Sizemore watched as her 5-year-old daughter, Ryan, made the walk to her kindergarten classroom. "I just felt this school would be more focused on her individual needs," said Sizemore. "They'll have some after-school programs that she'll really be interested in like yoga and dance and cooking. Broaden her horizons." The ribbon-cutting also drew a gaggle of city and local officials who came out to praise the ideals behind the new school. L.A. Deputy Mayor Brenda Shockley told the crowd Crete fit in with the mayor's larger goal to "eliminate and prevent homelessness and poverty with compassion and inclusion." Also attending the ribbon-cutting were L.A. Councilmember Marqueece Harris-Dawson and Nick Melvoin, a member of the L.A. Unified School Board.